It is always exciting to sell an antique item. It is especially exciting to sell a piece to an institution because we know that many more people will have the opportunity to observe an important piece of history. A few years ago, we received a call from Grant Quertermous, then Assistant Curator at Montpelier, James Madison’s home in Virginia. 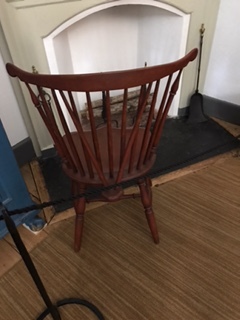 Grant purchased the fan back Windsor chairs for Montpelier. Since that time, we have been curious to see the chairs in their new home. Our trip to Virginia provided us the opportunity to see the chairs. Charlie and I were very excited and could not wait to begin the tour. We went through the downstairs, room by room, no chairs. I began to steel myself for disappointment as I made my way to the second floor. Maybe the chairs were not part of the exhibition. But then, in “Mr. 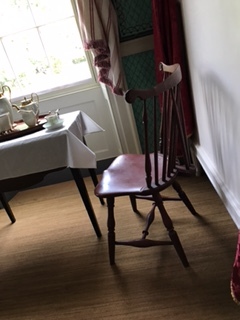 Madison’s Room,” right beside the bed where he uttered his last words, was one of the fan back chairs! What a special honor it was to see our chair here in James Madison’s room. We continued on with the tour into Mr. Madison’s library and there was the other fan back Windsor, in front of the fireplace. I had the urge to rearrange it, after all I knew this chair so well and wanted to show off its lovely proportions. But, I resisted and finished the tour. Our guide offered a very comprehensive explanation of Madison’s life, maybe because there were fewer people here than at the other two mansions we saw. Montpelier has only been open to the public since 2008. Dolley Madison was a larger than life figure in my young mind when I first read about her as a young child. It was certainly an honor to see her beautiful home. Montpelier had several owners before it became open to the public. William DuPont purchased the home in 1901. Extensive renovations were made to the house only to be demolished when the home was purchased to be displayed in its original form.